BioBoost-video nominated for award! Vote too! Interreg 2 Seas organises the Video Awards during their Mid-Term Review event 25 and 26 April in Ghent. 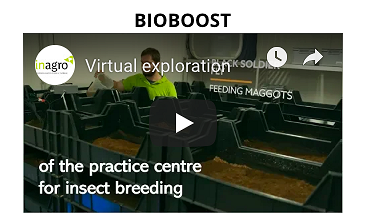 BioBoost did send in the video ‘Virtual exploration of the practice centre insect breeding of Inagro’, and the video is nominated! You can support us by voting for our video. You need to vote before 14 April. You can vote here (it takes some time to load the page). The short film is made by BioBoost partner Inagro. The film is a virtual exploration of the practice centre insect breeding of Inagro, opened in January 2018. It shows the various aspects of insect breeding. The larvae of insects feed on the plant residuals, such as leaves and unusable fruits and contain high contents of high-quality protein, fats and minerals that can be used in the food and feed industry. Inagro implements most of their project activities regarding insect breeding in this practice centre.